In addition to writing several chapters himself, Ravi Zacharias brings together many of today's leading apologists and Christian teachers, including Alister McGrath and John Lennox, to address topics present in the very future of worldwide Christianity-from the process of spiritual transformation to the challenges posed by militant atheism and a resurgent Islam. Destined to become a classic,'Beyond Opinion' is a touchstone that will affect Christians around the world. 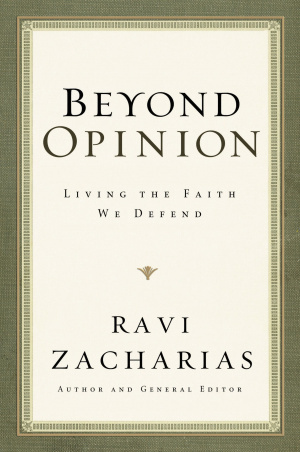 Beyond Opinion by Danielle DuRant; Ravi Zacharias was published by Thomas Nelson in January 2010 and is our 13109th best seller. The ISBN for Beyond Opinion is 9780849946530. Be the first to review Beyond Opinion! Got a question? No problem! Just click here to ask us about Beyond Opinion.